Professor Jeffrey Goldstone received his education at Cambridge University (B.A. 1954, Ph.D. 1958). He worked on the theory of nuclear matter under the guidance of Hans Bethe and developed the use of Feynman diagrams for non-relativistic many-fermion systems. Goldstone was a research fellow of Trinity College, Cambridge, from 1956-60 and held visiting research posts at Copenhagen, CERN and Harvard. During this time, his research focus shifted to particle physics and he investigated the nature of relativistic field theories with spontaneously broken symmetries. With Abdus Salam and Steven Weinberg, he proved that in such theories zero-mass particles (Nambu-Goldstone bosons) must exist. From 1962 to 1976, Goldstone was a faculty member at Cambridge. In the early 1970s, with Peter Goddard, Claudio Rebbi and Charles Thorn, he worked out the light-cone quantization theory of relativistic strings. He moved to the USA in 1977 as Professor of Physics at MIT, where he has been the Cecil and Ida Green Professor of Physics since 1983 and was Director of the MIT Center for Theoretical Physics from 1983-89. 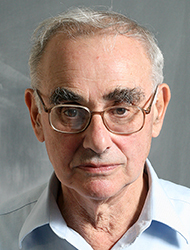 Goldstone published research on solitons in quantum field theory with Roman Jackiw and Frank Wilczek, and on the quantum strong law of large numbers with Edward Farhi and Samuel Gutmann. Since 1997, he has been working , with Farhi, Gutmann, Michael Sipser and Andrew Childs, on quantum computation algorithms. Goldstone is a Fellow of the Royal Society (elected 1977), of the American Academy of Arts and Sciences (1977), and of the American Physical Society (1987). He is also an Honorary Fellow of Trinity College, Cambridge (2000). Goldstone was awarded the 1981 Dannie Heineman Prize of the American Physical Society, the 1983 Guthrie Medal of the Institute of Physics (London), and the 1991 Dirac Medal of the International Center for Theoretical Physics (Trieste). Professor Goldstone's publications can be found online at SPIRES.